A dozen mixed colored roses set against traditional greenery is an enduring symbol of love and affection. It is sure to take his or her breath away. 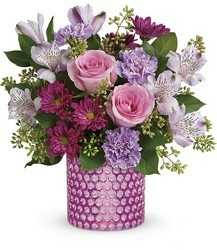 Designer's Choice Mixed Arrangement $50 Value. This precious keepsake comes filled with spring like flowers including, lilies, carnations, spray roses and gerbera daisies varying in colors. This design will look beautiful in any home and can be sent for any occasion.